The Man of Tomorrow clashes in fierce combat with mankind’s deadliest enemy—the Linid! The Captain Future saga follows the super-science pulp hero Curt Newton, along with his companions, The Futuremen: Grag the giant robot, Otho the android, and Simon Wright the living brain in a box. Together, they travel the solar system in series of classic pulp adventures, many of which written by the author of The Legion of Super-Heroes, Edmond Hamilton. Curt Newton, in quest of a friend lost inside Vulcan, faces the most insidious dangers he has ever known in his entire galactic career! 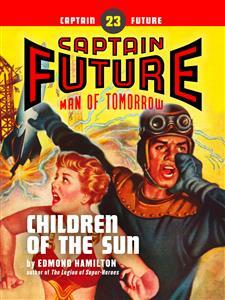 “Children of the Sun” was originally published in 1950. No part of this book may be reproduced or utilized in any form or by any means, electronic or mechanical, without permission in writing from the publisher. THE ship was small and dark and unobtrusive, speeding across the Solar System. It had a worn battered look, its plates roughened by strange radiation, dented by tiny meteors, tarnished by alien atmospheres. It had been far, this ship. In its time it had voyaged to the farthest shores of infinity, carrying its little crew of four on an odyssey unmatched in human annals. It had borne them to perils far around the universe—and back again. But not even the man who sat at its controls could dream that now, here inside the familiar System, it was bearing him toward the most strange and soul-shaking experience of all…. Curt Newton was oppressed, not by premonitions but by a self-accusing regret. The deep worry that he felt showed in the tautness of his face, in the set of his lean body. His red head was bent forward, his gray eyes anxiously searching the sun-beaten reaches of space ahead. The little ship was inside the orbit of Mercury. The whole sky ahead was dominated by the monster bulk of the Sun. It glared like a universe of flame, crowned by the awful radiance of its corona, reaching out blind mighty tentacles of fire. Newton scanned the region near the great orb’s limb. The impatience that had spurred him across half the System grew to an intolerable tension. Curt Newton looked at his companion. He saw nothing strange in the small square case hovering on its traction beams—the incredibly intricate serum-case that housed the living brain of him who had been Simon Wright, a man. That artificial voice had taught him his first words, the lens-like artificial eyes that watched him now had watched his first stumbling attempts to walk, the microphonic ears had heard his infant wails. Friend. He had had so few close human friends, this man whom the System called Captain Future. Always he had stood in the shadow of a loneliness that was the inescapable heritage of his strange childhood. Orphaned almost at birth he had grown to manhood on the lonely Moon, knowing no living creature but the three unhuman Futuremen. They had been his playmates, his teachers, his inseparable companions. Inevitably by that upbringing he was forever set apart from his own kind. Few people had ever penetrated that barrier of reserve. Philip Carlin had been one of them. And now Carlin was gone into mystery. A BRILLIANT scientist, Carlin had set out to study the mysteries of that strange world inside Vulcan which the Futuremen had discovered. He had hired a work-ship with heavy anti-heat equipment to take him to Vulcan, arranging for it to come back there for him in six months. But when the ship returned it had found no trace of Carlin in the ruined city that had been his base of operations. It had, after a futile search, come back with the news of his disappearance. All this had happened before the return of the Futuremen from their epoch-making voyage to Andromeda. And now Curt Newton was driving sunward, toward Vulcan, to solve the mystery of Carlin’s fate. Abruptly, from beyond the bulkhead door of the bridge-room, two voices, one deep and booming, the other lighter and touched with an odd sibilance, were raised in an outburst of argument. The door slid open and the remaining members of the unique quartet came in. One of them, at first glance, appeared wholly human—with a lithe lean figure and finely-cut features. And yet in his pointed white face and bright ironic eyes there lurked a disturbing strangeness. A man but no kin to the sons of Adam. An android, the perfect creation of scientific craft and wisdom—humanity carried to its highest power, and yet not human. He carried his difference with an air, but Curt Newton was aware that Otho was burdened with a loneliness far more keen than any he could know himself. Newton nodded. Otho was right. It was one thing to come and go between the planets, even between the stars. It was a wholly different thing to dare approach the Sun. The orbit of Mercury was a boundary, a limit. Any ship that went inside it was challenging the awful power of the great solar orb. Only ships equipped with the anti-heat apparatus dared enter that zone of terrible force—and then only at great peril. Only the fourth of the Futuremen seemed unworried. He crossed to the window, his towering metal bulk looming over them all. The same scientific genius that had created the android had shaped also this manlike metal giant, endowing him with intelligence equal to the human and with a strength far beyond anything human.